That word could be worth $500 billion to congressional Republicans as they try to play down the effect of President Donald Trump's tax cut proposal on the nation's debt. They're eyeing a switch in the standard Congress uses to measure the cost of tax cuts — from the "current law" baseline to a "current policy" baseline. The switch would mean that the tax cuts would appear to have far less impact on the long-term debt. Here's how it's worked in the past: Congressional budget experts measure the deficit impact of new legislation against current law. If, for example, a tax break on rum is set to expire in two years, the experts assume that the government will collect more revenue in the third, fourth and fifth years because the tax rate on rum will have gone back up after the break has expired. But the "current policy" baseline assumes that every law now in effect would continue in perpetuity, even if the law has a sunset date. Republicans like the "current policy" baseline because it means that projections of future government revenue are lower — and, as a result, tax cuts look smaller compared to current policy than they do compared to current law. Critics, including Rep. Richard Neal of Massachusetts, the top Democrat on the tax-writing Ways and Means Committee, said it's a sleight of hand designed to fool the public. "Too many times there's an effort made to confuse the issue by inventing a new set of numbers," he said in a brief interview. Budget experts across the political spectrum agree that switching baselines would lower projected government revenue by about $460 billion over the next decade — and perhaps more than $500 billion if interest is factored in — as the non-partisan Committee for a Responsible Federal Budget calculated last month. "It could be a lot of money," said Rep. John Yarmuth of Kentucky, the top Democrat on the House Budget Committee. "If you are able to pick your baseline, that's not what would be the most honest type of budgeting." Many Republicans believe that congressional budget-keeping rules make tax cuts look more expensive than they are. For years, they've argued that Washington bean-counters should use "dynamic" scoring rather than "static" scoring to account for new revenue coming into the Treasury from economic growth. Now, as the raw expense of Trump's tax plan reaches into the trillions of dollars, they'd also like to use the "current policy" baseline to shrink the deficit number attached to their plan. 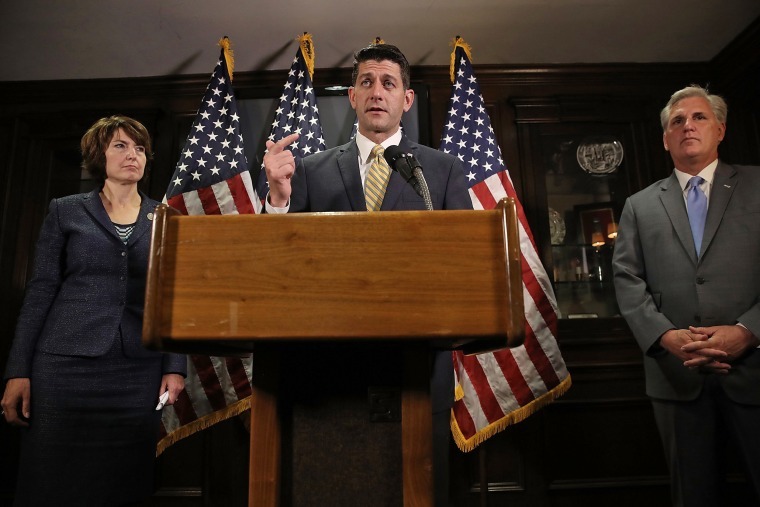 It's not clear whether House Speaker Paul Ryan, R-Wis., and Senate Majority Leader Mitch McConnell, R-Ky., will try to change the bookkeeping method in legislation, but the concept has taken hold as a talking point among rank-and-file members of the GOP. Rep. Mark Meadows, R-N.C., a leader among the House's most conservative faction, said Thursday it was his understanding that the tax-cut package would be measured against the "current policy" baseline, which, with its lower deficit number, would make it more politically palatable for his colleagues to vote for the Trump plan. "It's all about a vehicle to get there," he said. "If you are able to pick your baseline, that's not what would be the most honest type of budgeting." The choice of a baseline — "current law" or "current policy" — will be decided by House and Senate negotiators at a later date, according to a House Republican leadership aide. Chye-Ching Huang, deputy director of federal tax policy at the liberal Center on Budget and Policy Priorities, said that even if lawmakers don't tinker with the baseline, they'll still be making a political argument that they should be able to cut $500 billion in revenue without voters thinking of it as deficit spending. "Whether it's them attempting to cook the books or whether it's them dismissing the official scorekeeper as fake news, it's the same outcome," Huang said. But Senate Majority Whip John Cornyn, R-Texas, suggested the public has little interest in congressional budget rules. "Who cares about stuff like that?" he said. "None of your readers do."